After years of hearing about the "year of mobile," mobile-device usage for content consumption is now mainstream, and women are using their mobile devices to enjoy the lifestyle video content that they love. As part of the POPSUGAR Insights/ulive 2014 lifestyle video study, we asked women to share the devices that they most often watch lifestyle videos on when they are alone and when they are watching with others. When viewing alone, 60% of women are streaming lifestyle videos on either their desktop or laptop computers. About 46% of women prefer to stream via their laptop, and 37% prefer to stream via their desktop computer. The study shows 52% of women enjoy streaming lifestyle videos from their smartphone, and 35% of women prefer to view via their tablet computer. When viewing with others, 34% of women share their laptop computer, and 23% huddle around a desktop computer. Perhaps surprisingly, 22% of women lean back to enjoy lifestyle videos while streaming from their gaming device, and 18% prefer to view from a streaming device, such as an Apple TV, Roku, or Chromecast. 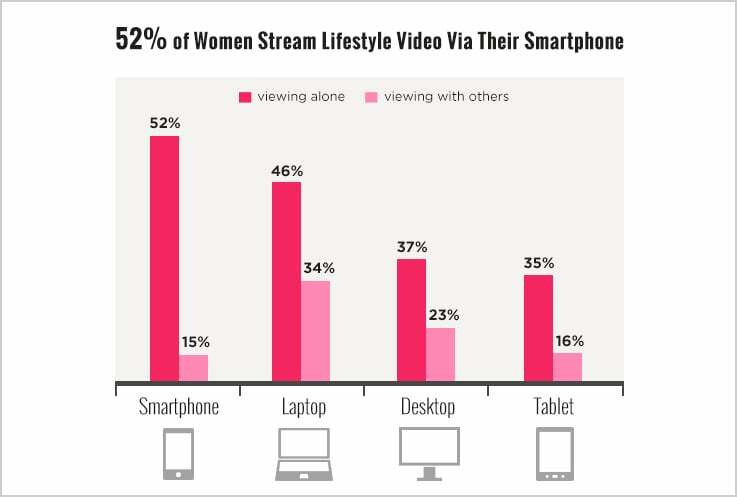 Only 16% of women view lifestyle videos with others using a tablet device, and 15% collectively watch via a smartphone.